17 April 1907: born in Tôkyô. 11 October 1912: his father Arashi Yoshisaburô IV dies. 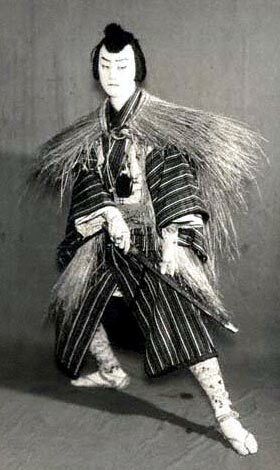 March 1914: he makes his first stage appearance, at the Hongôza, where he receives the name of Arashi Ichitarô III and plays the role of Komawakamaru in the drama "Wada Gassen Onna Maizuru". June 1927: Arashi Ichitarô III takes the name of Arashi Yoshisaburô V at the Shinbashi Enbujô; he starts to learn the art of wakaonnagata around that time from Onoe Kikugorô VI. June 1934: Yoshisaburô joins the Zenshinza troupe. 14 November 1977: Yoshisaburô dies in Tôkyô. Arashi Yoshisaburô V was a talented onnagata and nimaime actor belonging to the first generations of actors who built the Zenshinza troupe. Arashi Yoshisaburô V's atariyaku: Tanzaemon Motoyasu ("Shunkan"), Princess Taema ("Narukami"), Chiyo ("Terakoya"), Hayano Kanpei ("Kanadehon Chûshingura") and Honjô Tsunagorô ("Kokoro no Nazo Toketa Iroito").